So, I have a question about the suspension of 14th century longsword scabbards from plaque belts! I know that this is a commonly discussed topic of enigmatic origin, but I could not find anything in the forums related to my precise question. My question is pertaining to this image (below) that I found on Leo Todescini's website. I was wondering where this image comes from, and whether or not I can believe every one of these suspension methods to be authentic or not. Notably, suspension method #17 in the image (a locket staple/ring to hook front point and a leather loop back point, so that one can detach the hook, and slide the scabbard from the loop)! If any visual evidence can be supplied for the notable suspension method in question (like illuminations, effigies, brasses, or artifacts) that would be wonderful, especially if it can be shown hanging from a plaque belt. If it is doubtful that suspension method #17 is authentic, what would my options to suspend a longsword from a plaque belt be for the late 14th/early 15th centuries, other than a separate suspension belt or a single point locket staple/buckle from plaque belt suspension methods, which have already been covered in other forum posts. That's from Arms and Uniforms The Age of Chivalry Part 3 by Liliane and Fred Funcken. It's an Osprey type book. It's mostly re drawings of other art so I'd take it with a grain of salt. I don't know enough about 14th century suspensions to comment on the particular sword belt. The Osprey books would be 10,000 times more useful if their images and drawings were properly referenced. 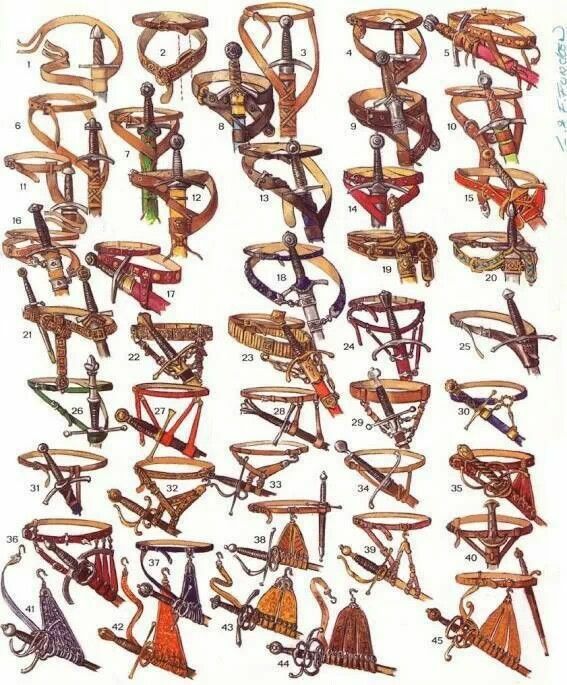 Well, if anything, for my future very early 15th century kit, I will probably be using the staple to ring to hook on plaque belt configuration. If we find out anything else, then the extra scabbard belt loop can be added behind the hook afterward! I hope we are able to find out more about late 14th - early 15th century suspension methods though, like I said, for the quality of future reenactment, and for the enrichment of history in general!